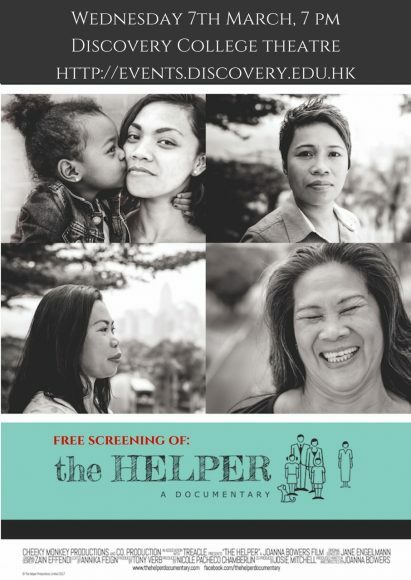 Please join the DCPTA on Wednesday 7 March at 7.00pm for a free screening of The Helper. This movie tells the stories from Hong Kong’s migrant domestic workers, the contribution they make to society and the separation from their loved ones in order to do so. It shines a light on the humanity and spirit of Hong Kong’s Unsung Heroes, a domestic helper’s choir, who have performed at Hong Kong’s annual music festival, Clockenflap. Their main song, “I Wish I Could Kiss You Goodnight” is a heartfelt reflection on the sadness the mothers feel at being separated from their children. As well as raising awareness about the sacrifice these mothers make for the sake of their families, the film is also designed to highlight the issues that many of the workers face on arrival in Hong Kong. For many of them, it is the first time they have traveled outside their home country, and they arrive with no money and limited language skills, leaving them vulnerable to abuse.